When we popped along to Biostar's suite today, the company had what looks to be a "close to final" GeForce 7050 / nForce 630i motherboard. Boards based on Nvidia's latest integrated chipset for Intel processors were initially showed off at this year's CeBIT trade show, but due to some problems with audio passing over HDMI, the silicon had to go for a respin. It looks like that silicon is finally back and the boards are almost ready for retail - Biostar said that its board would be shipping "very soon", with boards arriving in the US within a month. Pricing hasn't been confirmed, yet but we'll endeavour to get that before the product launches. On the features front, this board is undoubtedly aimed at the media centre enthusiast, which is largely thanks to its mATX form factor and the integrated GeForce 7-series graphics chipset. 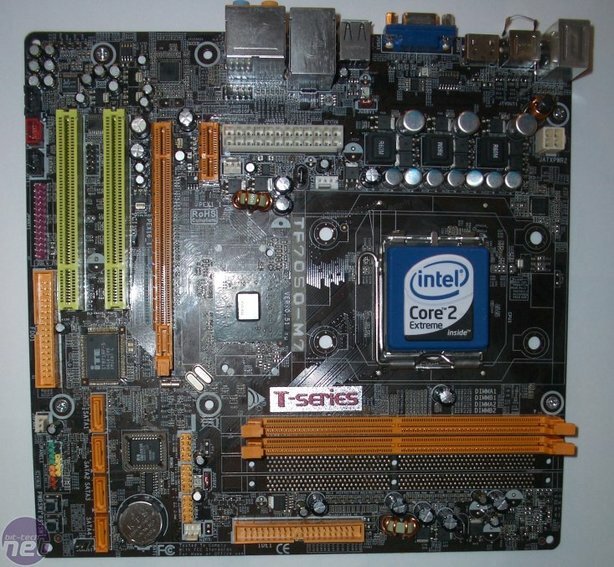 The board also supports all current Core 2 Duo, Core 2 Quad and Pentium D processors (we're assuming Core 2 Extreme CPUs are supported too) and up to 4GB of DDR2-800 memory. The IGP comes complete with PureVideo HD technology, meaning you can playback HD DVD and Blu-ray movies with respectable CPU usage, although it's the older GeForce 7-series video decoding technology and not what Nvidia recently introduced with its mid-range GeForce 8-series products. Interestingly, the HDCP crypto-ROM isn't embedded in the chipset and the motherboard vendors have to implement this themselves. We're still of the opinion that it's about time all GPUs and graphics cards were HDCP enabled by default - ATI has listened and delivered on that front, but Nvidia still continues down the rather confusing path of making it compulsory on higher end GPUs and optional on the lower-end products that are more likely to be used for video playback. Another CeBIT has come and gone and our week-long jaunt to Hannover is at an end. Here's a roundup of the information and hardware pictures that didn't make it onto the site last week, including Razer speakers, a chat with Creative Labs, Intel's Bearlake chipset and AMD's DTX form factor.